The main task of European Space Agency’s Proba-V minisatellite is monitoring vegetation growth on our planet—but it also sees something a little higher in our atmosphere, too: signals from thousands of aircraft. 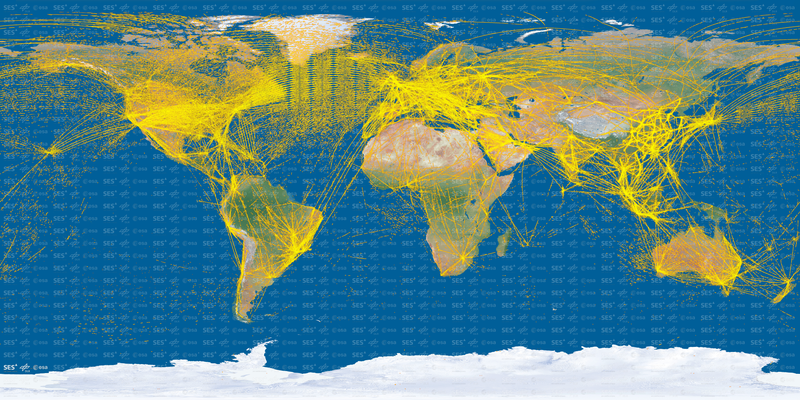 Proba-V has picked up upwards of 25 million positions from more than 15 000 separate aircraft. There are roughly 20 000 aircraft worldwide from which the DLR German Aerospace Center and SES team has captured more than 25 million positions. The team has identified more than 22 000 unique callsigns, identifying more than 15 000 aircraft by their unique International Civil Aviation Organisation (ICAO) addresses (one aircraft can share a callsign with others, depending on the flight route).